1930's vintage three button suit with button fly trousers. 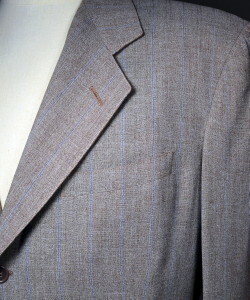 Heathered light chestnut brown with light blue pinstripe summer wool. Medium notched lapels. Angled welt breast pocket. Three buttons at cuffs. Two rounded patch pockets lower front. Taupe rayon half lining. No Vent. Flat front pants with button-fly. Coin pocket at outside front right waist seam. Side seam pockets. Button welt hip pocket right, welt hip pocket sans button left. Outstanding 1930's suit in a cool light weight fabric and gorgeous summer color... an exceptional alternative to a wrinkly linen. Sleeves, measured from seam to cuff edge - 25 1/2"
Center back length, measured from collar fold to hem edge - 31"
Length, out-seam - 43 1/2"
Length, inseam - 31 1/2"
Overall almost excellent condition. Jacket shows light soil marks at lining and light wear at cuffs. Slacks show light discolor at seat, light wear at pocket edges and wear, repairs & soil marks at cuffs. 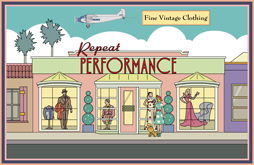 All issues consistent with a light vintage suit from the 1930's.